Krista and I first talked when she and Craig were engaged to get married. It didn’t work out that I was able to photograph their wedding, but I did have the opportunity to photograph Krista for her boudoir session, which was a gift for Craig on their wedding day. Krista and I had a wonderful time during her session and I was thrilled when she got in contact with me to let me know that she and Craig were adding to their family. When we talked, Krista mentioned that she wasn’t as thrilled with her wedding photos as she wished and I suggested that we do a combination session with her husband, Craig, getting both photos that focus on them and their relationship as well as maternity photos. Just love the variety that we got that day. Because I’m way behind in blogging, Krista and Craig SHOULD be in the process of having their little one today…apparently their baby felt that the due date was only a suggestion and today is to be the morning that they induce Krista if the baby didn’t arrive on his/her own. No facebook updates at this point, so I’m figuring that they are at the hospital right now. Soon, I get to see all of them again for the newborn session – can’t wait! 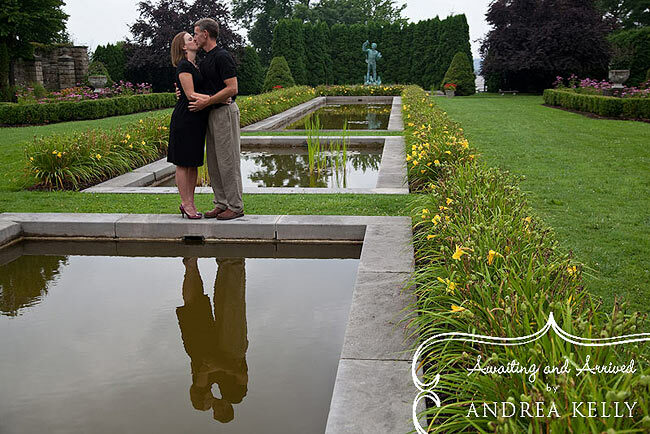 We used two separate locations for their photos – the first was at Schwab Estate in Loretto, PA, which is a beautiful location where I’ve photographed several times before, although this was the first time for a maternity session there. Although these images are in black and white, they have done the nursery in such pretty colors. They decided not to find out if they are having a little boy or girl, so they used a really cute neutral fish motif. More of the nursery when I return for the newborn session. I love the ones where she is in the baby’s room. Great job! Please click the play button on the lower left hand side or within the center of the screen to view the slideshow. If you would like to purchase this slideshow on a DVD to play on your TV or a mini book with all of these images, please contact us via email. Nicole and Mike’s story begins years ago back when they were 9th grade – first meeting one another in Algebra class that was taught by Mr. Kaylor (in honor of Mr. Kaylor, they have named their dog Kaylor!). They went on their first date together during their senior year of high school – and went to their prom together – there is an awesome photo of a picture of the two of them from their prom that they put on display along with several other photos of their time together (the photo of the prom photo will be in the slideshow…you’ll love it – how can you NOT love the 90’s!). Through the years, they went separate ways, but found one another once more in 2005, started dating and have been inseparable ever since. It has been a few years since I last photographed at the Springwood – it was as lovely as ever for Nicole + Mike’s wedding. I arrived a bit before Nicole so that I could begin to photographing some of the details and preparations – before I got started with those, I took just a minute or two to get a few photos of some of the flowers and surroundings. The raindrops on the petunias in the lower left tell the story of the showers that were happening on and off that morning. Loved the vibrant orange and fuschia that Nicole + Mike used for their wedding colors. The crocheted butterfly on the lower right was at the bottom of Nicole’s hankerchief she carred that day. The photo on the left just pulls me – I love this moment with her two sisters preparing to get Nicole’s veil placed on while Nicole’s mom is in the background getting ready to take a photo. And how gorgeous is Nicole? We had a moment to get a few quick portrait type photos before heading down to the ceremony site. Three of the 4 photos here were taken with my macro lens showcasing some of the flowers from in Nicole’s bouquet – the macro shots would make fantastic canvas prints to decorate in a home. As I mentioned, it had been raining off and on that day, and they had to make a decision about moving forward with the ceremony outside or move it indoors. While it was still iffy – the hourly weather forecast said that it would be clear – luckily for everyone, no rain! The couple included several wonderful readings and traditions within their ceremony to make it their own. I think that the first dance is often one of my favorite traditions at a reception – it seems like it’s a time when the couple just allows themself to soak in that they are husband and wife. You can just FEEL the love that Nicole and Mike have for one another. Congratulations Nicole and Mike! Wishing you years and years and years of happiness together! Beautiful! What a way to begin your lives together! Everything looks like is was perfect. Thanks for sharing with me. Congrats! Great job Andrea! Looks like it was a beautiful day! I received a call from Jessica back when she was JUST starting to plan the wedding day…even before she and John had set a date so that she could make certain I would be available on their wedding day. During their planning, many things changed, most notably finding out that Jessica’s mom (who was battling cancer) was not doing so well. At one point, Jessica sent me an email with a photo showing Gwyneth Paltrow and her mom, Blythe, in a photo taken by Annie Leibowitz and wanted to have a photo created similar to it…yeah, no pressure there!!! We discussed how and when we would create it to make it our own…yet, sadly, Jessica’s mom passed away before the wedding day. It’s moments like that which are a reminder as to why the job of a photographer is so important and it’s why I always do my best to capture any photos with loved ones that my couples request. The day started out at Bethesda Country Club where Jessica and her bridesmaids got ready and I had an opportunity to get a few of the detail photos I always like to get. An interesting thing to note: Jessica selected her gown at Hitched during a trunk show for Judd Waddell…she was the first to purchase the gown AND super bonus…the designer did a sketch and gave it to her of her in the gown! How awesome is that? I love these two photos – Jessica was just looking down as her dress was being buttoned and the other photo is of her Aunt (who is Jessica’s mom’s twin) and Jessica’s dad looking on as the transformation into a bride on her wedding day took place. One of my favorite parts of the day is seeing those few moments when people recognize a woman is becoming a “bride” after all the planning. Though I couldn’t hear what was being said, I think that John was telling Jessica how gorgeous she looked in the photo in the upper left. After the ceremony, they had a nice toast and ride to the country club where we took a few photos. The tree covered lane was perfect for capturing a photo of the Rolls. What a great bridal party! Loved the candlestick vases with a profusion of baby’s breath. Hydrangea’s were the secondary flower and were used as a decoration for the back of Jessica & John’s chairs and also as a centerpiece for the center table during cocktail hour. BTW, the vibrant fuschia color of the hydrangea’s was produced by the florist spray painting them! Such an excellent idea to make a donation in the honor of their guests to the John R. Marsh Cancer Center. First dance as husband and wife – after taking one dance lesson and deciding that it was one too many, they opted to dance to God Only Knows by the Beach Boys. The band had everyone up and moving – everyone was having too much fun. And hopefully there are no photos of me as I danced around a bit while I took photos! Probably some of my very favorite time to take photos is toward evening and dark. Jessica and John came out for a few minutes…John dipped her without prompting on my part! I was impressed! Just shortly thereafter, the sky was turning dark and I asked Jessica to just give me a simple pose with a bit of attitude…she did a great job! Great warm glow from the lights and candles during the reception as well as a few more glimpses of the fun people were having dancing. The photo of the sign and looking back at the country club and lane was taken as I was leaving for the night…Jessica emailed me to let me know that she had meant to ask me about taking a photo of the sign for the country club, but her boss was driving down the lane at night while I was taking the photo and already relayed to her that I got it! Congratulations, Jessica and John! Wishing you many, many years of happiness! Thank you for allowing me to get to know you and play an important role in your wedding day. Gown: Judd Waddell through Hitched Wedding Salon, Georgetown, Washington D.C.
Bakery: Georgetown Cupcake, Georgetown, Washington D.C.
My warmest congratulations to you and John. What a beautiful couple you both make. Man Andrea, these all ROCK!! I seriously have no favorite, I love every single one!!! Do you have PA Bride in your area (like we have NJ Bride)? Submit the wedding to them like this, I bet you’ll get published!!! i like your black and whites more than mine. What a wonderful day! It’s days like these that make me pinch myself to make sure that I’m not just dreaming…that I really get to do what I do for a living! When planning an outdoor ceremony in the east, you realize that there’s always a reasonable chance of rain. And from the looks of the weather forecast in the days proceeding their wedding, it seemed likely that Shannon and Tony’s outdoor ceremony was going to be moved indoors. Even on the drive from Pittsburgh to Morgantown the morning of the wedding, there were showers and ominous looking clouds. But, we were lucky – the afternoon turned into a beautiful one (though a bit humid!) and the outdoor ceremony at the 10th Tee of Lakeview Resort happened as planned. There are so many wonderful things to share about this wedding that I hardly know where to start…in some ways, it’s almost harder to blog about one full of details because I don’t want to leave anything out! It was the first that I actually met both Shannon and Tony – our previous contact (as with many of my couples) was by email and phone – both of them and their family and friends were all wonderful. In discussing plans, Shannon & Tony decided that they would exchange gifts on the day of the wedding to allow me the opportunity to document those moments since the gift giver usually doesn’t get to see the reaction. Tony got to open his gifts first and he’s a HUGE Steeler’s fan, so Shannon presented him with a special Steeler’s NFL watch to wear when they head to Pittsburgh for the September 10th season opener. Shannon created tickets to look like the real thing, but these included some wonderful extras like a two night hotel stay and a Friday night dinner date. So for all the Steeler fans out there, if you’ll be at the game, be sure to look for Shannon & Tony and say “Hi!” or watch for them on your tv at home. After hanging out with Tony and his guys for a bit, I went over to Shannon’s room. When I got there, I started photographing some of the details. Absolutely love Shannon’s e. ring, a gorgeous Asscher cut diamond. The couple wanted their out-of-town guests to completely enjoy the area, so Shannon created a tri-fold brochure listing things to do in the area along with the schedule of events that was place in gift bags. Shannon, being a WVU graduate placed the WVU cookie in the gift bags…there were a few extras, so I placed the rings on the cookie. Also pictured here is the handcrafted plates from Paloma’s Nest. Love the kate spade shoes that were in a gorgeous fucshia color perfectly matching the sash to Shannon’s dress. Once Shannon was dressed, it was time to open her gifts from Tony. She was in for the surprise of her life. Because they both work together at Deltek, Tony said that it’s almost impossible to keep something as a surprise, so Tony wouldn’t reveal to ANYONE where they were going on their honeymoon. When we were headed over from Tony’s room to Shannon’s with the gift, Tony told me to be certain to tell Shannon to look in the pockets – since he didn’t reveal what was inside the gift to me, I wasn’t certain what he meant at first, but he said that Shannon would understand as she started opening things up. Here you see where Shannon is reading Tony’s card and is about to wipe a happy tear away. And her look on her face in the next 3 pictures just doesn’t need any words at all…she certainly didn’t hide her astonishment and happiness! When Shannon opened the box, she found a Versace bag…and when she ope ned it up, she found out where they were going on their honeymoon – two weeks in Greece! (If you’re their friend on Facebook, you’ll be able to see some of the photos they took while they were there.) And lastly, a pair of diamond stud earrings – an “upgrade” to replace one of the earrings she lost. I think that Shannon’s feet hardly touched the ground as she walked up the aisle to meet Tony! And they both were just so happy the whole time during the ceremony. From the position of the sun during the ceremony, I was able to get some nice photos with sunflare – I’m a fan of flare, so it’s always great when I have an opportunity to capture it a bit. The couple opted for a profusion of carnations and orchids for their reception centerpieces. Shannon carried a hand-tied bouquet with peonies, listianthus, and crystal-studded orchids, while Tony wore a matching orchid boutonniere. After the ceremony, we took a few minutes for their Romance Session to get some great photos of the two of them. The last photo was inspired by going out onto the deck in the evening. When I went out, I loved the Chinese lanterns that Shannon and Tony decided to use outside on the deck. Most of my couples are more than happy to go out for a few minutes to get some great photos and as soon as I walked out and saw the lights glowing, I knew exactly the photo I wanted to create for them. There were challenges because we were surrounded by guests all around and some tables, so it took an extra minute or so for setup with my assistant, but the challenges were worth it – I just love this image on the far right! Lovely work from a stylish wedding. I really love the album-style design of your blog post. Shannon and Tony look great! Your pictures are fantastic too! It looks like you had a wonderful day. Enjoy married life. Terri – thaks for the blog love, it’s much appreciated! Slideshow with additional photos should be going up next week, so be sure to stop back! As I mentioned in my last post, I’ve got a lot to update everyone on…one of the important updates is that I am accepting more maternity and newborn sessions than before because I find that I really love them. I’ve always enjoyed the adrenaline rush of documenting weddings – seeing the blending of families as a couple unites together – all the laughter, happiness, nods of old traditions along with new, modern takes. But, I never imagined how much I would love documenting in a “boutique studio” experience. Documenting those moments of expectation of a mom-to-be (and sometimes dad-to-be as well) and ultimately meeting and photographing the newborn has been beyond words and I am looking forward to expanding this portion of my photography even further. As I get time, I am working on developing a website to showcase my maternity and newborn work, though I expect it to be a bit down the road until it is fully functional! However, even without the dedicated website for that, I am happy to photograph in the Pittsburgh and central PA area. If you are a former wedding client of mine and not in the area, get in touch with me anyway…as most of you know, I’ve traveled a good bit and we might be able to work things out. Last bits of chat for now, you’ll notice a new logo being used on my blog posts…the logo and my colors are being replaced a bit at a time, so don’t be surprised to see changes to that happening, and I’m happy to hear feedback on those things. So, all this talk and no photos yet. I leave you with a few photos of Stephanie from her “Awaiting” session. LOVE the names of the sessions, Awaiting and Arrived. Can’t wait to see more of your maternity/newborn work!